Jade Barbosa and Daiane dos Santos, two of the gymnasts involved in the developing Brazilian gymnastics scandal, will not be competing in the World Cup Final in Madrid this December, according to the Brazilian news media (see here, e.g.). Following the new rankings, Barbosa is currently ranked sixth on vault and dos Santos is ranked third on floor. But because of injury, neither will compete. 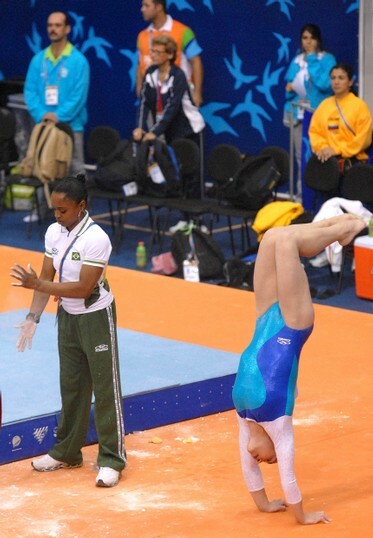 Dos Santos won gold in 2004 and 2006 on floor, but will not be able to defend her title. Daniele Hypolito, currently ranked 12th on floor and 15th on bars, will only be able to defend her 2006 silver on bars if enough higher-ranked gymnasts choose not to compete. 1 Response to "It’s official: Barbosa and dos Santos out for the World Cup Final"
I think that’s a good thing though. I love Jade and hope she can get better so she can compete again.